Almost 50% of advertisers don’t use negative keywords in their Google Ads campaigns, and it’s costing them. Save budget and wasted clicks with these tips on how to do them right. Research shows that nearly half of advertisers are getting one thing wrong. Can you guess what it is? Negative keywords are chosen by you and can be added to your Google Ads campaigns to save you money and reduce wasted clicks. 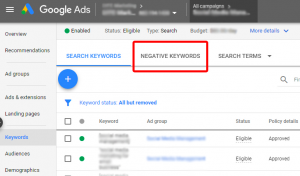 Negative keywords are a list of words or phrases that you can add to your Google Ads to determine what is not relevant to your website. This means when they’re searched for your ad doesn’t come up as it otherwise would have done, meaning you save your budget for those top quality searches that are most likely to convert. Google Ads features an advertising filter tool that enables you to stop your ads being shown to the wrong audience. This is achieved by erasing particular keywords from your campaign and is the easiest way to get rid of those impressions that aren’t going to produce results. Since there’s a right ad that can be shown to the right person at the right time, it also means that there is a wrong ad to show the wrong person at the wrong time. This is where negative keywords could make your campaigns much more efficient and save you budget. It’s really no good if someone who is looking for reading glasses ends up on your website which sells expensive crystal-cut glass goblets. This could easily happen since they’re both technically “glasses” – and you’ll paying for them to be there! A good starting point is to google your main keywords. Have a look as to what comes up on the first few pages of Google. See anything that isn’t relevant? Make that a negative keyword. There you go – you’ve already made a start of a good negative keyword list! Once you’ve added those words to your campaigns, you’ll be taking money back from wasted clicks in no time. You can stop there if you want, but there are a lot more negative keywords out there. Each of them represents wasted budget, so it’s worth a little effort to make sure your campaigns are running efficiently. One of the best ways to find negative keywords is to look at the Search Query Report. This shows you the actual words that were typed into Google to trigger your ads. You can then filter this info to see which had the highest click-through and conversion rates. Firstly, this is great for seeing if what you thought was performing well actually is, and which irrelevant searches could be costing you extra cash. You can then take these words and use anything that isn’t working as a great basis for your negative keywords list. Also, you can use the Google Ads Keyword Planner to find negative keyword inspiration. The tool is designed to show suggestions of words to bid on, but as a savvy user, you can use this to work out what you don’t want to bid on. For example, if Google is suggesting “crystal glass sets” and you don’t sell them, add that term to your negative keywords. It’s easy to think once you’ve tackled one negative keyword that you’ve saved loads of money and that’s job done. Sadly, this isn’t the case. There’s a whole host of things that people could search for unrelated to your campaign which could still bring up your ads. Let’s go back to the glasses example. So, you’ve warded off people that are searching for reading glasses and maybe even sunglasses, designer glasses, opticians, and all those other spectacle-related things. But what about things which are related to your site, but aren’t specific enough? We’re talking about those people who want cheap tumbler glasses or plastic party glasses, for example. They’re definitely not after your expensive cut crystal. Worse still, you’re not likely to change someone’s mind even if they end up on your page. It pays to think of all the possibilities that could bring people to your site and protect yourself against those wasted searches. Go out of the box and try to cover as many negative words as you can, otherwise, they could be costing you money. 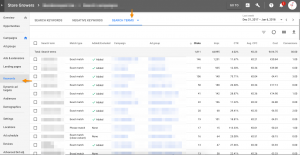 Now we’re going to look at how you can use Google Ads’ negative keyword feature to make your search queries more specific. For instance, if you have a single keyword ad group for [expensive crystal glasses] but you have a broader keywords ad group for words like +crystal +glasses, your ad could come up for either search. Your audience won’t be as specifically targeted if they’ve only searched for +glasses, so you may want to save your budget for that golden [expensive crystal glasses] search. To achieve this, you can put [expensive crystal glasses] as a negative keyword on your broader +crystal +glasses ad group as well as in any other broader campaigns you have set up. What this means is you can devise a strategy that causes specific keywords to trigger a specific campaign. This may sound complicated but is a lot simpler in practice and it could really help boost those high-quality conversions. When it comes to Google Ads, almost half of advertisers don’t add a single negative keyword to their accounts over the course of a month. It’s a really important aspect of Google Ads to master, otherwise, you’re definitely wasting money. These tips should help you to start implementing negative keywords. But, if you feel the world of Google Ads to still be a little overwhelming, it might be worth seeking some extra help. Which is where Adzooma can really benefit you! Are you currently running campaigns on Google Ads but want to increase performance and save time? We offer a FREE PPC Health Check so you can see just how well your campaigns are currently performing. Then, if you feel you want the experts to help you, our friendly team can easily arrange this for you and get the best from your campaigns. You can also find out what you can expect with the FREE Adzooma Health Check report here. Are you wanting to run your own Google Ads campaigns but don’t know where to start? Let Adzooma generate more customers for your business through one of our Google Ads management packages. Our expert team is on hand ready to help boost website conversions for your business.